We still have openings for ushers at a number of our performances this summer. Get a free T-shirt and be part of the excitement at our shows! Click here for more information or contact us if you'd like to volunteer. The staff at Moosewood once again pitched in and held a special brunch to benefit this summer's production. Many thanks to them and to violinist Max Buckholtz for donating his time and talent to entertain the guests! 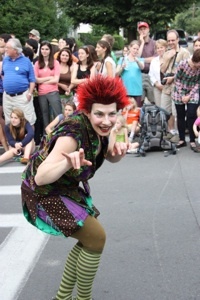 The Ithaca Festival is the biggest community celebration of the year in Ithaca, and this year the ISC was right in the middle of it! The cast of Macbeth marched in the parade on Thursday, June 3, and entertained the crowd with a variety of swordfights and costumed characters, including three witches from Macbeth and the ever-popular Puck from A Midsummer Night's Dream. See more pictures from the parade on our website. Donate money. Let's face it: it takes money to put on a theatre production, and as much as 90% of the funding for our shows comes directly from our supporters and audience members. Your financial contributions are what enable us to make exciting, inexpensive classical theatre available to our community. And every contribution, no matter how big or small, can help. If you can make a donation to help support our work, please visit our website. You can make a quick, secure online contribution, or find instructions for donating by check. Donate time. As we said above, we still need ushers at some performances. Visit our website or contact us if you're interested in becoming an usher or helping out with the production in other ways. 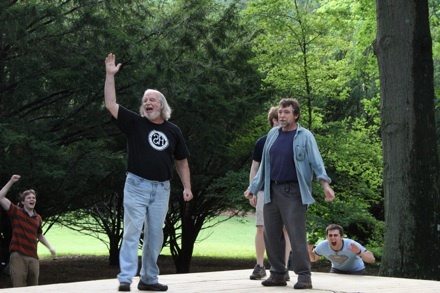 Take a peek behind the scenes of the Scottish play! The opening mass combat fight is broken into two parts. 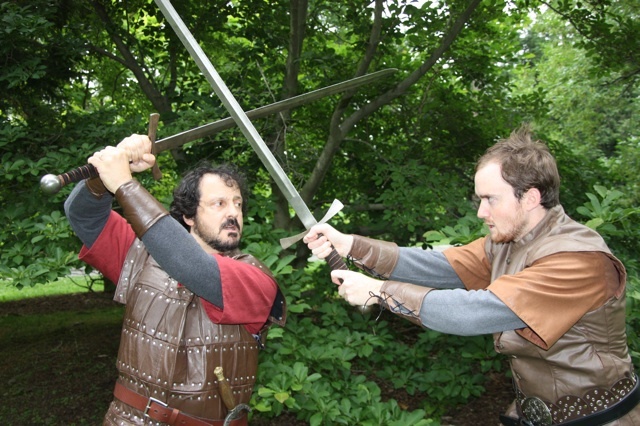 The first part shows the audience how Macbeth and Banquo have fought side by side, each having saved the others life. Banquo is Macbeth's shield and brother in arms. The second half of the fight foreshadows the action of the play. A few elements to watch for include: the forced separation of Macbeth and Banquo, three deaths correlating to three murders, and the placement of troops putting Macbeth in the center of three groups of three. There are concepts that repeat themselves throughout the fights. Large circular motions result in switching or exchanging of weapon placement, reflecting the witches' saying that fair is foul and foul is fair. The use of groups of three occurs repeatedly, inspired by the importance of threes in the witches' prophecy. Examples include the positioning of the fighters in the opening battle and the repetition of maneuvers in later fights. For example, Macbeth shoulder charges Macduff three times before moving around him. Heroic and noble characters are often placed on the audience's right, while less admirable characters are placed on the left. The weapons themselves have symbolism. The axe represent anger and vengeance. The sword and shield duality lends itself to the imagery of family, as shields often had the family crest on them. 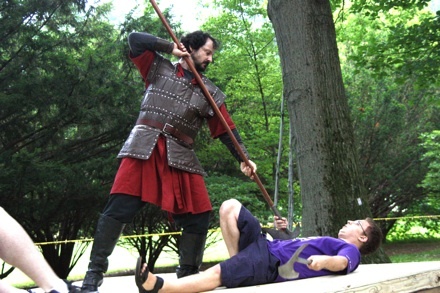 When Banquo is murdered, for example, he manages to hand his shield off to his son Fleance. The halberd holds honor and nobility; this is seen in the way it is acquired by Macbeth in the opening fight in defense of friend. 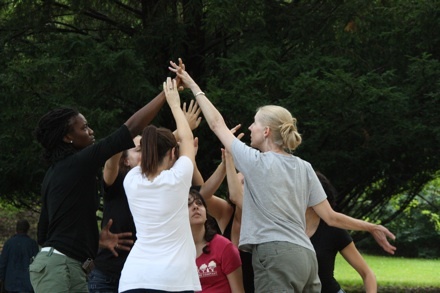 The Macbeth-Young Siward fight was choreographed by Benjamin Lehman. This fight is one of contrasts, between experience and youth and between the old Scottish nobility and the more Anglicized court that Malcolm will bring in. Macbeth demonstrates his complete faith in the prophecy and the depths to which he has sunk through the aggressiveness of his maneuvers and his use of the dagger, associated with murder, both in tradition and in the text. These motifs are reinforced in this fight to be met and transformed in the final battle. The final battle between Macbeth and Macduff is divided into two parts, much like the opening mass combat fight, only this fight is about the resolution of the prophecy rather then foretelling. In the first part, Macduff is stripped of his sword by Macbeth and forced to a lowly position, mirroring the taking of his family and his being forced to flee Scotland. Macduff rises again to fight Macbeth, conviction renewed, with an axe he found by his feet, like the axe over his dead sons body. Soon it becomes apparent that vengeance alone is not enough to kill Macbeth, even when the same dagger used to kill Duncan is pointed at his face: Macbeth lives a charmed life. The second part starts after the prophecy's final reveal. For the first time Macbeth does not start on the audience's right and spends most of this fight trying to get back to the right, but is stopped by Macduff. At this point Macduff is more than a man; he is the embodiment of a fate that Macbeth cannot overcome. The extreme length of the blades now being used echoes the honor of halberds and attempt by Macbeth to return to that honor he had in the opening fight. 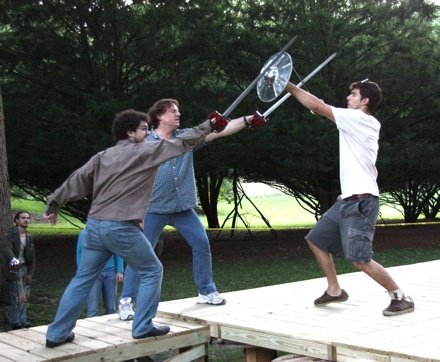 As the fight progresses, they move farther down the blades, mimicking the loss of virtue that has occurred throughout the play. Only after a weapon switch is Macbeth able to move past Macduff to right, no longer directly resisting Macduff but moving with him. This shows Macbeth accepting his fate, allowing him to at least die with honor, back on the side of right.